How Much Business Are You Losing By Ignoring The Basic Rules Of Customer Service? The following video, presented by Roger Simpson, Australia’s #1 Authority On Customer ROI In The Retail Industry, previews the systems and solutions he and his team have developed over many years to help retailers overcome the pitfalls associated with providing quality customer service in today’s market. If you’re a business owner, CEO or senior leader in the retail industry, you are responsible for creating long-term success for your business. This responsibility is accompanied by two very real trends that impact your bottom line – current levels of customer dissatisfaction are at an all-time high and online shopping is growing by leaps and bounds. Many retail businesses focus on trying to provide the cheapest price and don’t give customers a reason to come back. They ignore the most basic principles of customer service, with sales assistants treating customers as inconveniences, and then lose those customers to the online sphere or to other competitors who are getting it right. 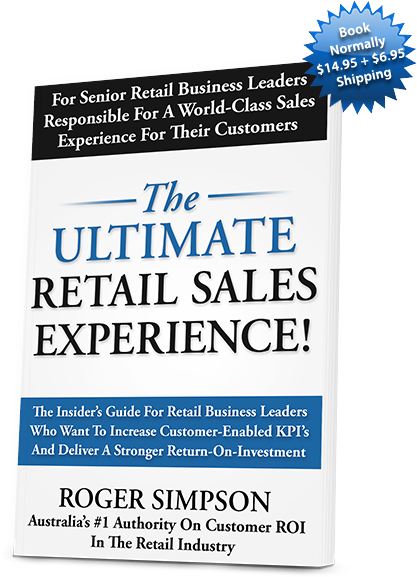 Roger Simpson has made it his mission to share his insights with business owners, CEOs and senior leaders in the retail industry who are responsible for maximising performance and profitability.